At some point in your life you will inevitably find yourself in a situation where you feel out-of-place. This could happen at anytime anywhere and on some occasions you won’t even notice it yourself, but you are. It happened to me last night at around about half seven in the evening while with my girlfriend. We were sitting at the back-end of a bar called The Windmill when the feeling struck. I had just realised the bottle of water sat in a side pocket of my rucksack was leaking and had created somewhat of a puddle on our table. We both knew what was happening in this groovy little bar and after a quick look around at the crowd we realised we stuck out like two elderly women at an underground rap battle. However, we didn’t come here to blend in, we were after all, on a mission to see the spoken word collective known as Poeticat. 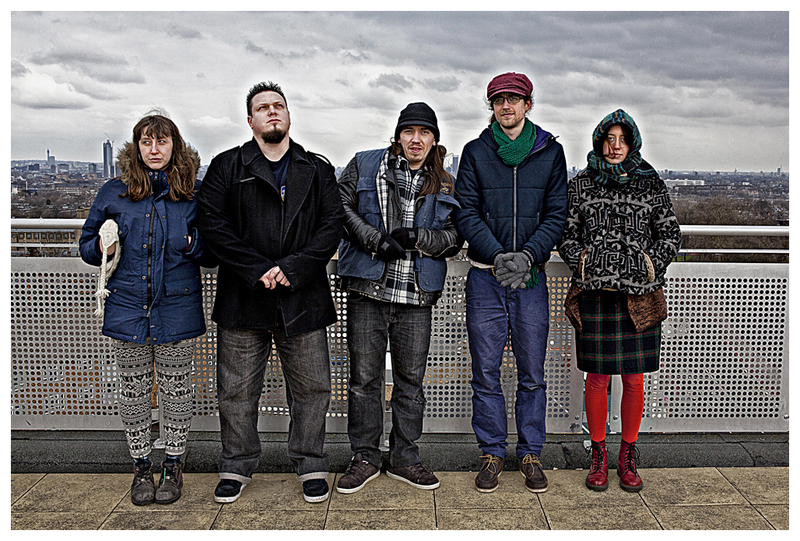 Hailing from London and Lisbon, the group were known in some circles for their thought-provoking, poetic vocal delivery mixed with some pretty trippy, genre bending music. Poeticat consists of performance poet Catherine Martindale, European Theatre Arts graduate and vocal harmonist Ziggi Jadozski, guitarist Baj Kendrick, Percussionist Vic Meadowcross and bassist Dr. Goat Foot. Yes, you read that right, Dr. Goat Foot. The evening signalled the release of two singles from Poeticat named Kind Words Soft Kill and Centre of the Concrete Square. I also received a folded card containing the lyrics to both singles and a free download of both by a woman who apologised profusely for interrupting before disappearing into the depths of the bar once again. I have now downloaded the two and I must admit they are growing on me pretty fast. I can’t quite explain how or why as I never really heard anything like what Poeticat produce before. This group is definitely pushing certain boundaries and they do it rather well indeed. 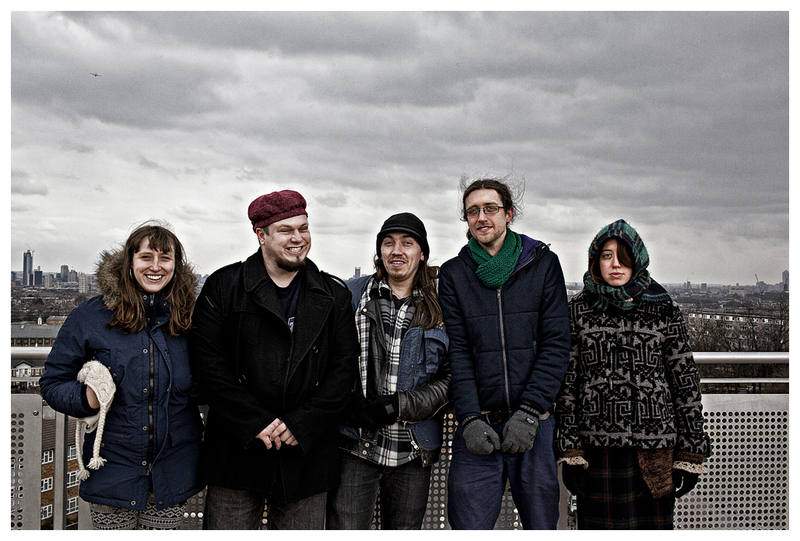 Having formed in 2009, the gang have been going from strength to strength with the addition of acoustic and electric instruments accompanying their ear-catching spoken word vocals. Their music has been described as a mixture of latin american music with african rhythms fused with complex metal riffs and melodies that call upon Testament to Metallica. I would even go as far as to describe their song Rooftops as a full on acid trip in your ear. Despite maybe not having heard of them before, it’s not like these guys aren’t getting around. The list of festivals they have played is impressive including several appearances at Glastonbury, Latitude, Big Chill, Bestival and smaller festivals like Small World. They were joined last night by Ukele playing teller of tales Wendy Soloman, Joelle Taylor, a performance poet who made her début on the spoken word circuit supporting the Pogues in the late eighties and Birdradio, a solo one man band multi-instrumentalist and every one of the acts performed a memorable set. Of that I can assure you. Trying to describe what they are like to see live is quite difficult here because there is so little to compare them to. Having supported the likes of Kate Nash, Ed Sheeran and Jamie Woon there has been talk of these guys bringing their spoken word psychedelic carnations into the mainstream helped and supported through the publicly funded National Lottery Arts Council and I for one believe that money has gone to good use. Poeticat create something that is original and compelling while at the same time downright groovy. You should see this band. That is an order. Author: RJMorwood Travel Writer and Freelance Journalist. Somewhere in the distant future.